The marquis of the El Capitan Theater in Los Angeles became the backdrop for a free concert in front of 10,000 people when Jimmy Kimmel booked back-to-back superstar guests Sir Paul McCartney and Justin Timberlake on September 23 & 24. Upstage Video was front and center for the big event with their 10’x17’ Lighthouse R7 mobile LED screen. 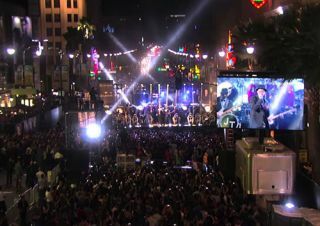 Although the home viewers only got to see 2 performances from Sir McCartney, the crowd gathered on Hollywood Blvd was treated to a set of 13 additional crowd-pleasers including songs by The Beatles, Wings and a few solo songs. Timberlake performed a similar set of old and new with songs ranging from 2002’s “Cry Me a River” to his newest single, “Take Back the Night”.